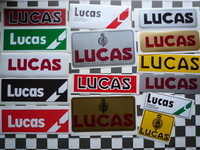 Lucas - I Say Ding Dong Shop - Buy Stickers, Decals & Unique Automobilia. 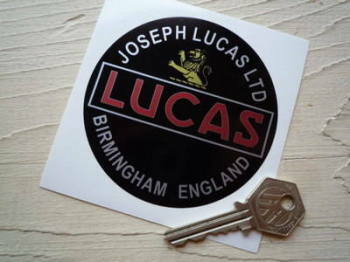 Joseph Lucas Ltd Birmingham England Round Sticker. 3.5". 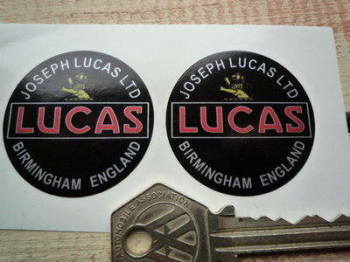 Joseph Lucas Ltd Birmingham England Round Stickers. 40mm or 50mm Pair. Joseph Lucas Prince of Darkness Shield Sticker. 2.25". Lucas Black & Red Oblong Stickers. 3.5" or 6" Pair. Lucas Black & Silver Oblong Stickers. 3" Pair. 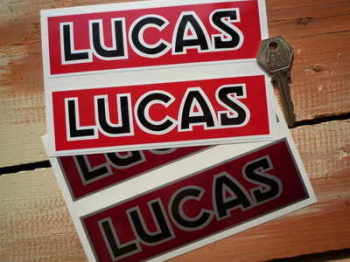 Lucas Black, Red, & Foil Oblong Sticker. 6". Lucas Blue & White Oblong Stickers. 4" Pair. Lucas Blue & Yellow Oblong Stickers. 4", 6", or 8" Pair. Lucas Blue & Yellow Thicker Style Oblong Stickers. 8.25" Pair. 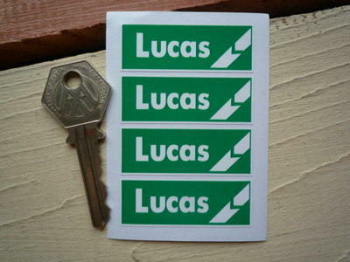 Lucas Break Green & White Deep Oblong Stickers. 8" Pair. 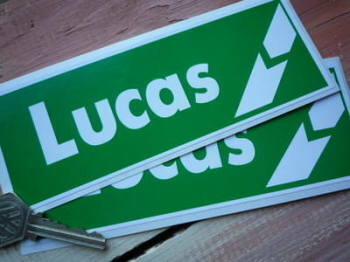 Lucas Break Green & White Oblong Stickers. 7" Pair. 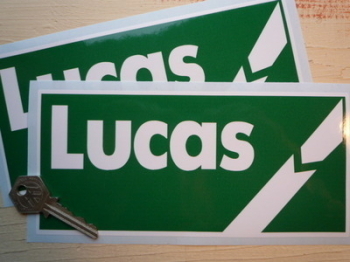 Lucas Break Green & White Oblong Stickers. 8" Pair. 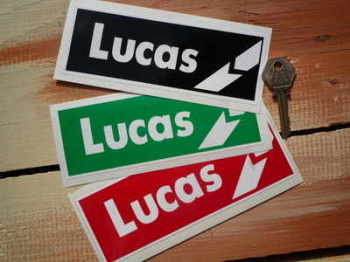 Lucas Break Red & White Oblong Stickers. 8" Pair. 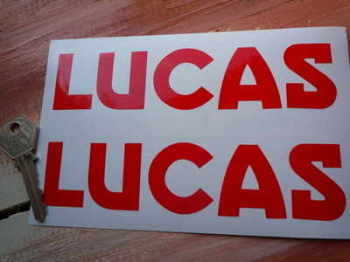 Lucas Break Stickers. Black, Red or Green. 6" Pair. 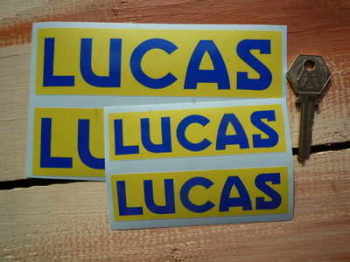 Lucas Bulbs Large Workshop Sticker. 35.5". 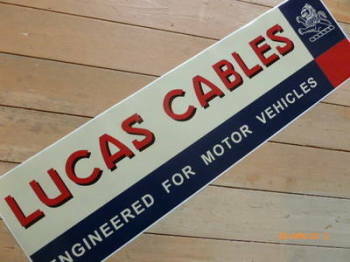 Lucas Cables Large Workshop Sticker. 35.5". Lucas Cut Text Stickers. 6" Pair. Lucas Cut Text Stickers. 75mm or 85mm Pair. 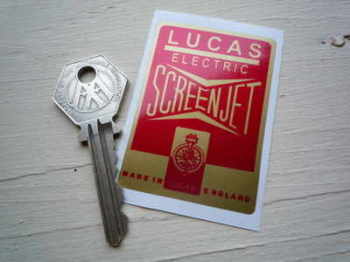 Lucas Electric Screen Jet Sticker. 60mm or 80mm. 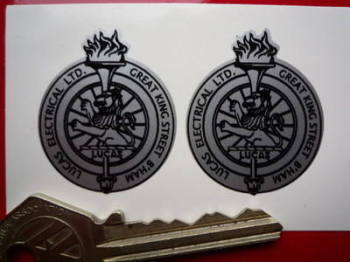 Lucas Electrical Ltd. Birmingham Lion & Torch Laser Cut Self Adhesive Badge. 1.25". 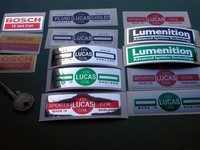 Lucas Electrical Ltd. Birmingham Lion & Torch Stickers. 1.25" Pair. 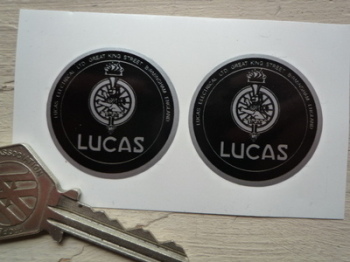 Lucas Electrical Ltd. Black Background Lion & Torch Stickers. 1.25" Pair. 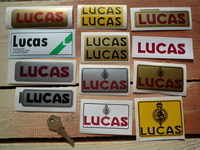 Lucas Electrical Ltd. Oblong Laser Cut Self Adhesive Badges. 18mm or 32mm Pair. 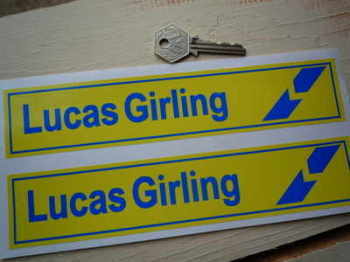 Lucas Electrical Ltd. Oblong Silver Style Self Adhesive Badges. 20mm Pair. 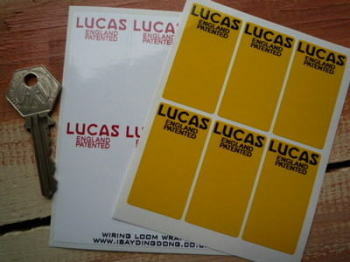 Lucas England Patented Wiring Loom Wraps. Set of 6. 2". Lucas Family Motto Sticker. 2.5" or 4". 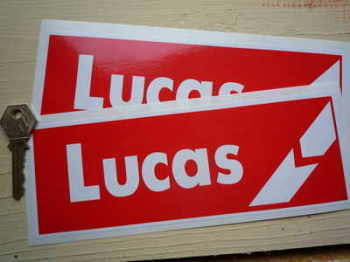 Lucas FX Sport Circular Sticker. 5". Lucas Girling. Blue & Yellow Break Stickers. 9" Pair. 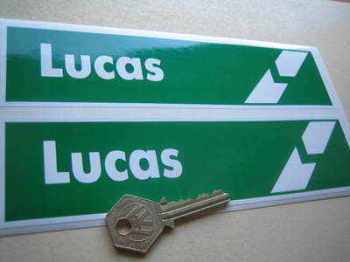 Lucas Green Break Stickers. Set of 4. 2". 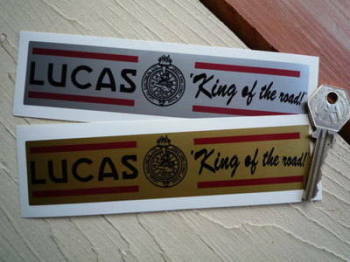 Lucas King of the Road No.742 Sticker. 2". Lucas King Of The Road Oblong Sticker. 6".